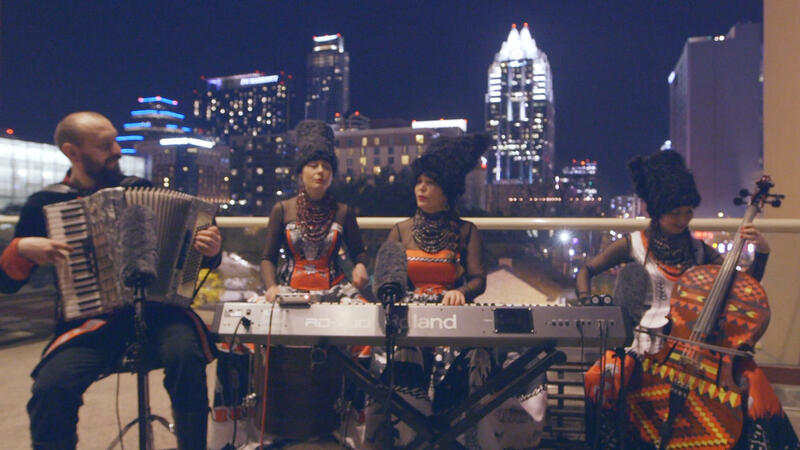 DakhaBrakha performs a lullaby during SXSW. Late at night, we asked DakhaBrakha to bring its cello, keyboard, accordion – and tall, wool hats! — to the balcony of the Hilton Austin hotel overlooking Austin, Texas. They played "Kolyskova" from 2010's Light, but the band only ever calls it "Lullaby." It's a quiet, contemplative song that the band says is a "connecting of several lullabies" with "philosophical lyrics that [say] we have time for everything — time to laugh and cry, time to live and die." Producers: Bob Boilen, Mito Habe-Evans; Director/Videographer: Nickolai Hammar; Audio Engineer: Josh Rogosin; Photo: Nickolai Hammar; Executive Producer: Anya Grundmann. Support for NPR Music comes from Blue Microphone.